Intimidation sponsored Kyle Rozewski is set to return to action later this month, fighting for the first time since moving permanently to China earlier this year. In his return the cage “Kyote” will compete for the Kunlun Fight MMA promotion in their April 4th even in Kazakhstan. Rozewski (8-4-1), who is undefeated while competing since moving to China, is set to take on 27-year old Askar Umbetov (2-1), a native of Kazakhstan. Rozewski is a native of Western New York who trained at Evolve MMA in Medina, Ohio before moving to China. Since signing on with Intimidation in July 2013, Rozewski (@KyoteRozewski on Twitter & InstaGram) has quickly become one of the brand’s superstars helping the company expand into Central and Western New York by sponsoring multiple Local MMA and grappling events. Rozewski is a veteran of the two Driven MMA events in Northeast Ohio having submitted Dustin Kempf in the first round of their featured bout at the Intimidation-sponsored Driven MMA One event in March. He last fought in Cleveland in a featured bout at “Driven MMA presents NAAFS: Fight Nite in the Flats 10” in June 2014. A winner of 8 of his last 10 MMA outings, Rozewski scored all four of his professional victories in the USA via submission. During his 9-fight amateur career he was involved in 4 title fights and he holds an unblemished kickboxing record at 155 pounds. In addition, Rozewski is a Hayastan Level 3 grappler under Norman Yonkers and first degree black belt in Kenpo under Robert Koch. Rozewski also excels outside of the cage, where he works as a writer, and has also served as a commentator for the Intimidation sponsored TNT Fight Series in New York, Coveted FC in Ohio and Pinnacle Fighting Championships in Pittsburgh. He was also the co-host of The Kyote Ugly Show, a weekly Internet radio show/podcast where he works with veteran MMA journalist David McKinney. Intimidation also released a signature shirt for Rozewski in 2014, which is available for purchase now. Intimidation Clothing and Cleveland, Ohio-based pro bantamweight Jerrell Hodge are pleased to announce the release of the latest signature tee from Intimidation – the Jerrell “Thunderkat” Hodge signature shirt. Hodge (0-1 pro, 11-1 amateur) is expected to fight professionally for the second time at NAAFS: Caged Vengeance 16 on March 7th, 2015, in Canton, Ohio. Pre-orders on the new “Thunderkat” shirts are underway at a special, discounted price. > Buy the new Jerrell “Thunderkat” Hodge signature tee online today! Just 25 years old, Hodge was widely considered to be perhaps the best pound-for-pound amateur fighter in the state of Ohio, if not the entire Midwest, prior to his pro debut in June 2014. The Evolve MMA product is a 2-time NAAFS national series amateur champion, becoming the first fighter since Team Intimidation’s George Comer to accomplish that feat in 2 separate divisions. Hodge was also the EFP amateur featherweight champion, as he claimed that title with a second round submission over Ethan Goss in January 2014, and he closed out his amateur career with a victory over Rich Cantolina in March 2014 to become the Pinnacle FC amateur featherweight champion. In his extensive amateur MMA career Hodge fought many of the best at 135 & 145lbs and has wins over notable pros Shane Valko (1-0 pro) and UFC bantamweight Cody Garbrandt (6-0 pro). Fans can follow Jerrell “Thunderkat” Hodge on Twitter @r3llhodg3. Long-time Team Intimidation member Isaiah “The Beast” Chapman is set to make his World Series of Fighting debut at WSOF 13 in Philadelphia. Chapman (6-1) is set to face Timur Valiev (7-1) in a main card bout on Saturday, September 13, and the fight will air live on the NBC Sports Network. 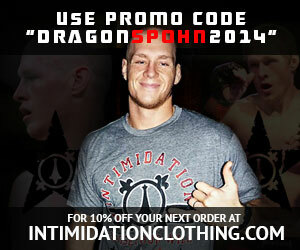 Sporting board shorts again from Intimidation Clothing, Chapman returned to the cage in March after a layoff of 11 months, stemming from a shoulder injury that he suffered in his only pro loss against Bryan Goldsby. Chapman put on an impressive performance at “Driven MMA One,” earning a clear-cut unanimous decision over the tough Charles Stanford. He then returned to action at the annual “Fight Nite in the Flats X” event in Cleveland in June, earning a dominant unanimous decision victory over American Top Team product Andrew Whitney to improve his record to 6-1. There were rumors that the win over Whitney would earn Chapman a spot on the national stage, and those rumors rang true as he signed a deal with WSOF last month to make his debut. The organization has quickly become one of the most respected in the country, running regular events on NBC and the NBC Sports Network. The fast-rising Gladiators of the Cage MMA promotion returns to action in Pittsburgh on Saturday, August 9th for “The North Shore’s Rise to Power VI” with Intimidation Clothing proudly sponsoring the event. After a successful debut in Ohio in July, Gladiators of the Cage is welcomed home at Stage AE in Pittsburgh, PA with popular local product Dominic Mazzotta headlining the card, which will be broadcast on PPV. Intimidation is no stranger to the Pittsburgh and Western Pennsylvania region having sponsored several events in Pittsburgh, Erie, Altoona, Johnstown and more in the past few years including multiple Gladiators of the Cage events. The Intimidation brand will be represented by Pittsburgh’s own Out of the Cage Clothing, an official dealer of Intimidation Clothing merchandise. A one-stop shop for fight fans in Pittsburgh, Out of the Cage Clothing is conveniently located on Steubenville Pike in Oakdale, and carries all of the top MMA clothing brands, including Jaco, Headrush, Hayabusa, Panic Switch, Throwdown, TapouT, Torque, and of course Intimidation Clothing. Intimidation Clothing is pleased to announce the release of their new Kyle “Kyote” Rozewski signature shirt. A veteran of 9 amateur and 8 professional MMA fights, Rozewski is a native of Western New York who now lives in Northeast Ohio and trains at Evolve MMA in Medina, Ohio. Since signing on with Intimidation in July 2013, Rozewski (@EvolveKyote on Twitter, @KyoteRozewski on InstaGram) has quickly become one of the brand’s superstars helping the company expand into Central and Western New York by sponsoring multiple Local MMA events. In addition, Rozewski has been a key piece to helping Intimidation establish sponsorships with amateur David Whitman and rising WMMA star Rebecca Heintzman. A winner of 4 of his last 6 outings, Rozewski now holds all four of his professional victories via submission. During his 9-fight amateur career he was involved in 4 title fights and he holds an unblemished kickboxing record at 155 pounds. In addition, Rozewski is a Hayastan Level 3 grappler under Norman Yonkers and first degree black belt in Kenpo under Robert Koch. Rozewski also excels outside of the cage, where he works as a writer, and also serves as a commentator for the Intimidation sponsored TNT Fight Series in New York, Coveted FC in Ohio and Pinnacle Fighting Championships in Pittsburgh. He is also the co-host of The Kyote Ugly Show, a weekly Internet radio show/podcast where he works with veteran MMA journalist David McKinney. The Kyle “Kyote” Rozewski signature shirt is a 100% cotton, 4.5 oz black tee featuring a custom coyote design on the front with Kyle’s name and signature on the back. All shirts are currently available on a pre-order basis with shipments expected to be made in late August 2014.